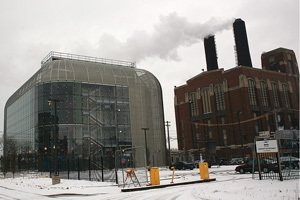 The juxtaposition of the Helmut Jahn-designed South Campus Chiller Plant (left) and the University Steam Plant represents the old and the new working in concert to supply necessary utilities to the University’s South Campus buildings. The two plants and a planned South Campus Utility Corridor will support the new undergraduate residence hall and the future Reva and David Logan Center for Creative and Performing Arts, as well as existing buildings. The University’s long tradition of commissioning some of the best architects to design new buildings on the Chicago campus continues with the award-winning South Campus Chiller Plant—designed by Chicago-based architect Helmut Jahn and winner of a Chicago Architecture Foundation 2008 Patron of the Year Award. The winning projects, selected through a rigorous jury review of 27 nominees, represent outstanding architectural projects in commercial, institutional and governmental categories. The South Campus Chiller Plant, built adjacent to the University Steam Plant at 61st Street and Dorchester Avenue, was completed in August. Murphy/Jahn Architects served as the design architect and Burns & McDonnell the design engineer. The new chiller plant is designed to house 10,500 tons of chiller capacity. The South Campus Chiller Plant, the University Steam Plant and a planned South Campus Utility Corridor will support new construction on the South Campus, such as the new student residence hall and the Reva and David Logan Center for Creative and Performing Arts, as well as existing buildings. The University’s South Campus Chiller Plant is among a group of five winners: Chicago Greenworks, LLC for Christy Webber Landscapes, Rancho Verde; Serta International for Serta International Center; Spertus Institute of Jewish Studies for the new Spertus Institute of Jewish Studies; the Chicago Housing Authority and Holsten Real Estate Development Corporation for Hilliard Towers Apartments. A jury of honored architects and business professionals from the Chicago area selected the Patron of the Year Award winners. Now in its fifth year, the award honors architecture leaders who commission, finance and execute significant architecture in the Chicago area. The South Campus Chiller Plant is but one building designed by a renowned architect that sits on the University’s South Campus. The new Jahn-designed building joins the neighboring Eero Saarinen-designed D’Angelo Law Library on the Laird Bell Quadrangle, Edward Durrell Stone’s Graduate Residence Hall and Mies Van de Rohe’s School of Social Service Administration. For further information about the awards and the CAF, visit http://www.architecture.org or call (312) 922-3432.